Definition at line 58 of file SLPVectorizer.h. Definition at line 59 of file SLPVectorizer.h. Definition at line 60 of file SLPVectorizer.h. 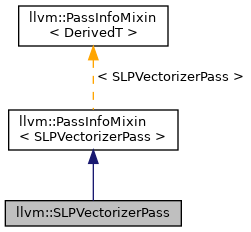 Definition at line 61 of file SLPVectorizer.h. Definition at line 62 of file SLPVectorizer.h. Definition at line 4928 of file SLPVectorizer.cpp. References llvm::PreservedAnalyses::all(), F(), llvm::AnalysisManager< IRUnitT, ExtraArgTs >::getCachedResult(), llvm::AnalysisManager< IRUnitT, ExtraArgTs >::getResult(), llvm::PreservedAnalyses::preserve(), llvm::PreservedAnalyses::preserveSet(), and runImpl(). Definition at line 4950 of file SLPVectorizer.cpp. References llvm::dbgs(), llvm::Module::getDataLayout(), llvm::Function::getEntryBlock(), llvm::Value::getName(), llvm::GlobalValue::getParent(), llvm::Function::hasFnAttribute(), LLVM_DEBUG, llvm::post_order(), and llvm::verifyFunction(). Definition at line 67 of file SLPVectorizer.h. Definition at line 70 of file SLPVectorizer.h. Definition at line 71 of file SLPVectorizer.h. Definition at line 72 of file SLPVectorizer.h. Definition at line 69 of file SLPVectorizer.h. Definition at line 68 of file SLPVectorizer.h. Definition at line 64 of file SLPVectorizer.h. Definition at line 66 of file SLPVectorizer.h. Definition at line 65 of file SLPVectorizer.h.